LEN - www.lankaenews.com | Damning expose`- Baneful politicians a curse for the country obstruct a huge 1000 billion investment boon ! -Malik and Sujeewa demand 25 million Euro as commission !! Damning expose`- Baneful politicians a curse for the country obstruct a huge 1000 billion investment boon ! -Malik and Sujeewa demand 25 million Euro as commission !! (Lanka e News – 23.Sep.2018, 2.52PM) Here is a most shocking revelation which would shake the entire country to its foundation ! Because of the avarice for illicit commission of rascally traitorous politicians a massive investment project which would earn for the country euro 5 billion annually (Rs. 1000 billion approximately!) , provide direct employment to 22500 Sri Lankans and a further 40000 employment opportunities indirectly , has been villainously delayed for nearly two long years ! The colossal investment involves the manufacture of power coaches (electric trains) necessary for the world .The investors are only making one request in regard to this from SL. They only want 2000 acres of land . Another 2000 acres of land they will be purchasing here. The initial investment is US dollars 500 million . If it was in any other country , when there are prospects of such a huge investment which is a boon to the country , those responsible would cast aside all other engagements and would fully devote their time and energy to make sure the investment is clinched for the benefit of the country. Sadly however in SL , minister of foreign investment and State minister Malik Samaraweera and Sujeewa Senasinghe respectively are obstructing and delaying this project for nearly two years because the illicit commission of 25 million Euros they demanded had been refused. It is a pity it is only in this rare country where the ruthless savagery of political scoundrels co exists with the gullibility and docility of the people so much so that the worst crooked and corrupt politicians are able to successfully masquerade as greatest patriots . 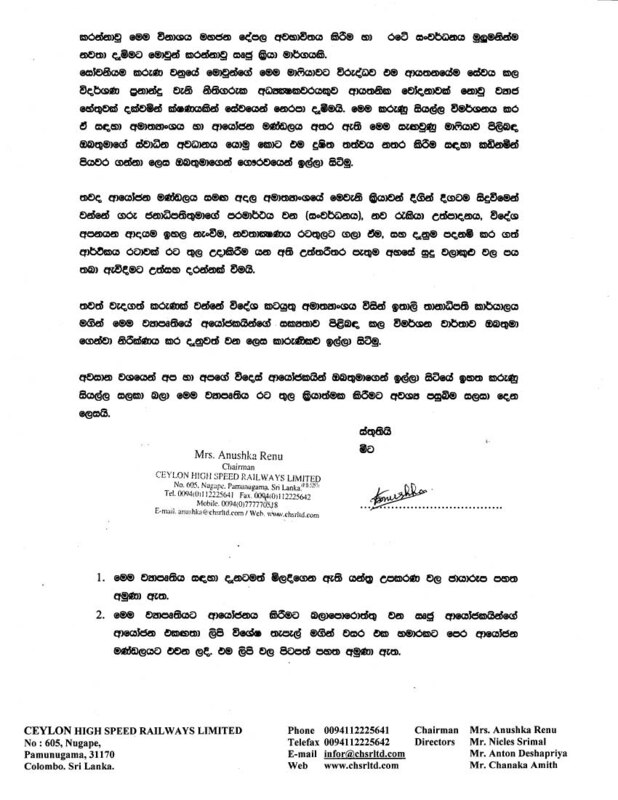 The chairperson of Ceylon High Speed Railways Co. Ms. Anushka Renu in connection with this investment has sent a letter to president Maithripala Sirisena expressing her woes and the injustice she is facing consistently. 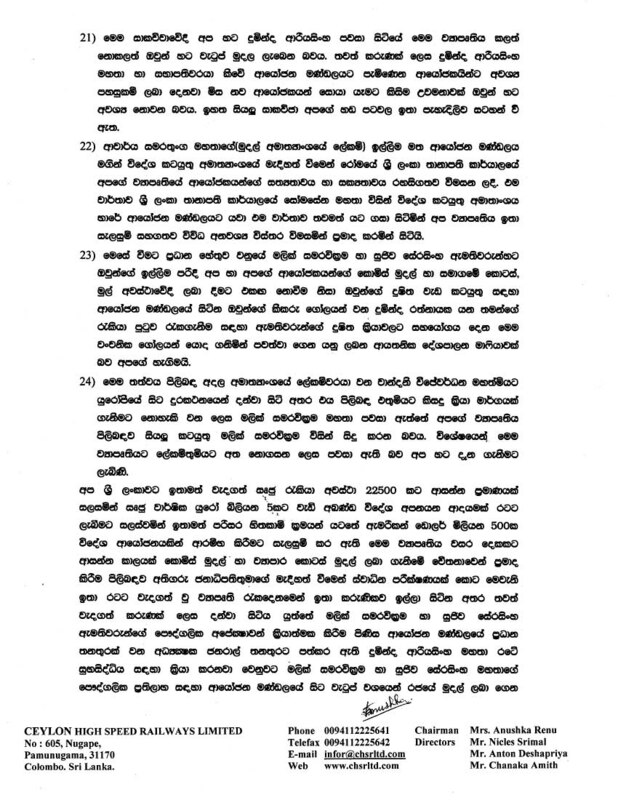 ( Renu is not aware Sirisena occupies top most berth when it comes to grabbing illicit commission ). It will be pertinent to reveal a salient fact in this regard : Sirasa of Kili Maharaja , a company which is virtually an intimate and integral part of president Sirisena’s underwear has made a most bizarre proposal relating to this project. That is , a veiled extortion threat that if Maharaja Co. is not made a share holder of this project, there is room for the Maharaja’s media chain to sling mud viciously against it. 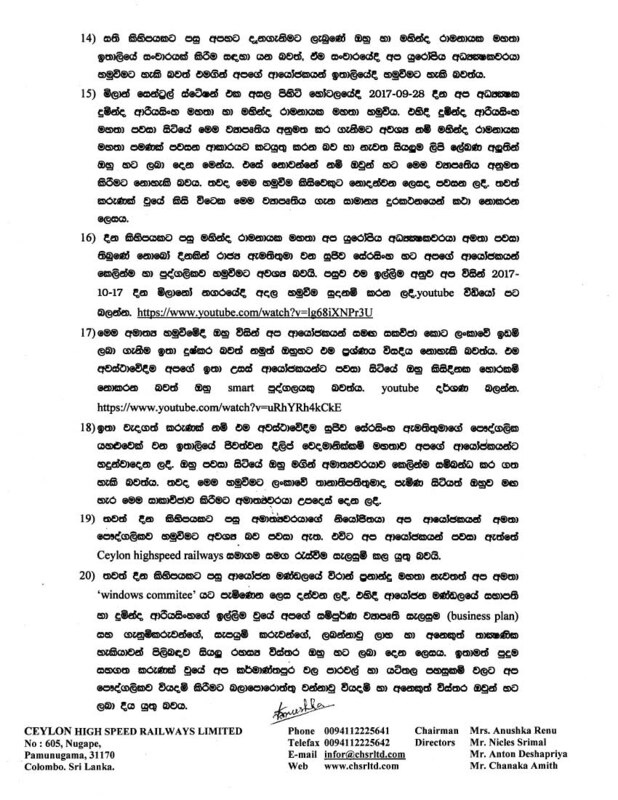 Sujeewa Senasinghe who parades as a paragon of virtue has gone to Italy to meet the prospective investor to convince he is ‘a smart individual who does not rob’. While making this ‘smart’ claim he has appointed a personal crony and henchman of his by the name of Dilip Vethamanikkam residing in Italy to negotiate the illicit commission deal with the Ambassador in Italy . Malik Samarawickrema too has sent Duminda Ariyasinghe , the Director general of the Board of investment along with Mahinda Ramanayake another notorious businessman of the Blue brigand to Italy to meet the investors . 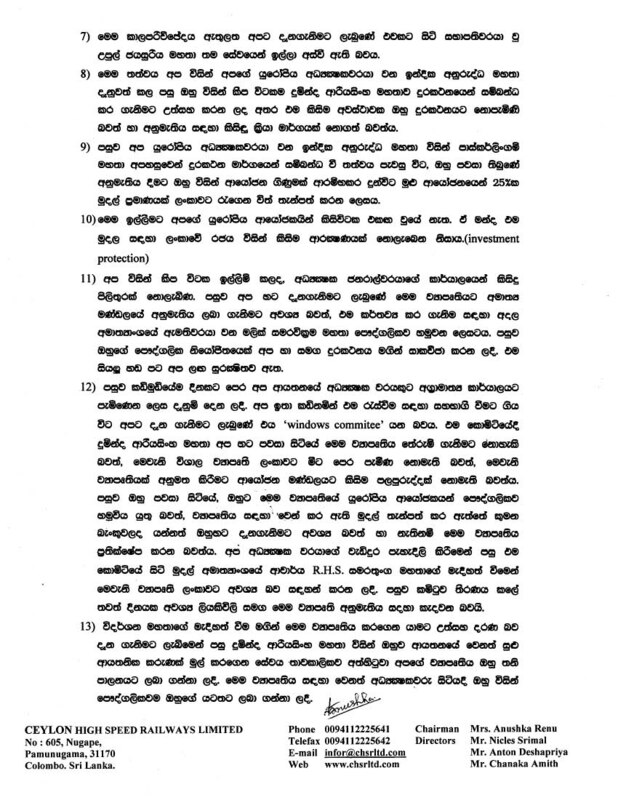 Duminda has told , if the investment project is to go through , everything should be done according to what Ramanayake says. Malik and Sujeewa have requested their Euro 25 million illicit commission through the intermediaries brought in by them . Ariyasinghe the director general of the investment board who is dancing according to the tune of Malik and Sujeewa has told the investors , whether the investment goes through or not, they will be receiving their salaries. Vis a vis the manipulations and machinations of these two Illicit commission seeking crooks (ICSCs) to the detriment of the country , it is a vital question whether these two most dishonorable rascals from the cesspit of corruption can be permitted to continue as ‘honorable’ ministers of the cabinet any longer? It is for the people to decide whether self centered rascals like ‘antique’ Malik who has outlived his utility on earth and has no popularity base should be mollycoddled or kicked in the arse and thrown out. 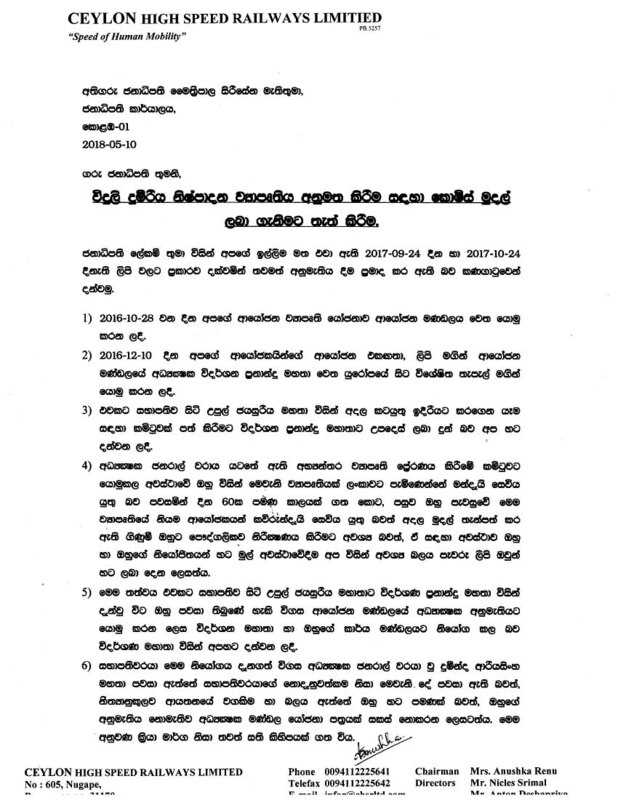 Renu the chairperson of Ceylon High Speed Railways Co. has in her letter to the president exposed in detail all the sinister motives and the sins committed by these two sinning political scoundrels . The equipment and machineries already purchased and the letter of concurrence of the investors sent to the investment board way back two years ago are in the photographs herein . They can be viewed by magnification.